I arrived today for a few days in Rome prior to hosting my Artfully Tasteful Tour of Tuscany. I was reminded again that getting off the plane in Europe can be disorienting. Interpreting foreign signs and languages while sleep deprived and groggy can be a challenge. If you’re not with a group, here are a few things I have learned which might help you navigate your way to town from the Rome Airport. 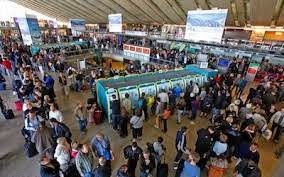 Wherever your first point of entry into the EU happens to be, it is there you must go through passport control. 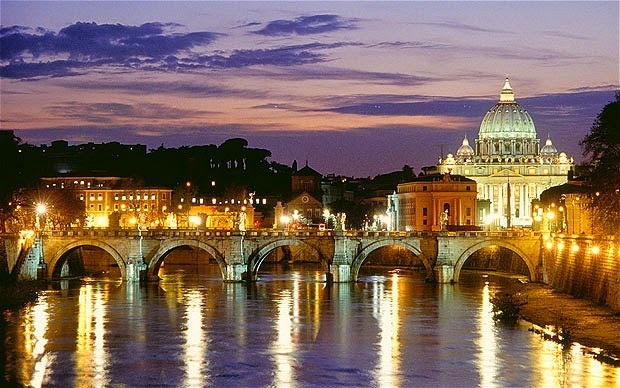 If you fly direct and enter the EU by landing in Rome, then you must to through passport control there. From there you follow the “Bagliali” Signs to claim your luggage. There is essentially no luggage inspection after that, so you merely need to follow signs to the “Uscita” or exit. 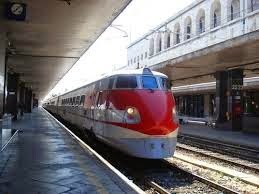 Once you claim your luggage, you can hop on the train into Rome’s Termini Station (for central Rome). Finding your way to the train gets a little confusing at the airport. Once you exit the baggage claim, you will need to go UP to the train departure area. The elevators are not clear on this point. Today we witnessed many a tourist walking around in a jet-lagged daze, riding the elevators up and down, trying to figure out where to go to get to the trains. Once you get to the train station, you need to purchase a ticket. After purchasing a ticket, you run it through the ticket stamper at the edge of the entrance to the train platforms. You slide it in order to stamp it, and then get on your train. This is important, as we found out later that you can be fined if you don’t stamp your ticket prior to getting on the train. If you have a lot of luggage, riding the trains can be a challenge, but not impossible. You may need to leave your large bags near the entrance to the car, and then take your seat. As much as possible, you will want to make it difficult to run off easily with your baggage. I might suggest placing a locked bike safety cord through the handles of your luggage. That way they are secured as a group and not easily moved. Once you arrive at Rome’s Termini station, make sure you are prepared to be on your toes for opportunistic crime. Don’t leave your phone or wallet on the tabletop while you have a cappuccino. Put your purse or your pack over your head and across the front of your body. Have your money and passport in your money belt. Don’t hang your purse on the back of your chair. 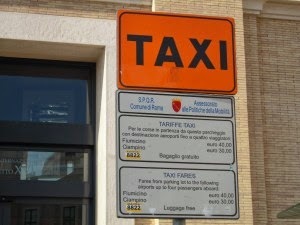 Official Taxi Stands at the Termini are clearly marked with a sign and details of fare stipulations. If you don’t see a line and a sign with detailed fare information, then look for another official taxi location. We learned this the hard way. After wandering up to an official looking Taxi sign, we spoke to a man who represented himself as the taxi director, and he sent us to a small white SUV. Once he began loading our luggage, we noted that he did not have a “TAXI” sign on the top of his car. We asked him “Quanta costo?” or “How Much?” and his quote was an outrageous 35 Euros for a 5 minute cab ride. We declined the ride and found the real taxi line across the Termini Train Platform and outside another exit door. In the end, we paid 13 Euros, plus 3 Euros for extra bags. This story is reminiscent of NYC, and so just be aware that unofficial taxis are a potential rip-off. Even real taxis, may try to pull a fast one…possibly starting the meter or not starting the meter. Be cautious, and your radar should probably go off if the cabbie doesn’t want to bring you to the door of your hotel, or flips the seat forward to cover the meter. Watch out for funny business, and make sure they are official taxi’s with a lit white sign on the top of the car. If you come to Rome, I hope these suggestions make it a bit easier for you to get into town and avoid getting into trouble along the way. If you have any other ideas that might be helpful to travelers coming into Rome, feel free to leave your comments here. 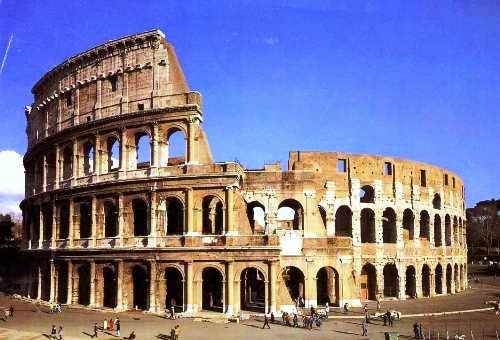 Tomorrow we visit the Colosseum with a private guide! Stay tuned!